My dad has always said “Kitesurfers never drink enough water!” Well dad, that won’t be a problem for me anymore! In fact, many sportspeople in and out of the water struggle to stay hydrated while doing their sport since it is inconvenient and sometimes impossible to carry a water bottle. While running, hiking or exercising at the gym it can be very inconvenient to carry a water bottle around with you and when doing something like kitesurfing or stand up paddling, it can be nearly impossible! That is why I am so excited to tell you about Wetsleeve. Wetsleeve is a wearable hydration sleeve which holds up to 350ml. It is available in three sizes and comes with an adjustable strap, ensuring maximum comfort. You can fill up the sleeve with water or an energy drink and it will stay cold inside the sleeve, while keeping your arm dry and allowing your skin to breathe. 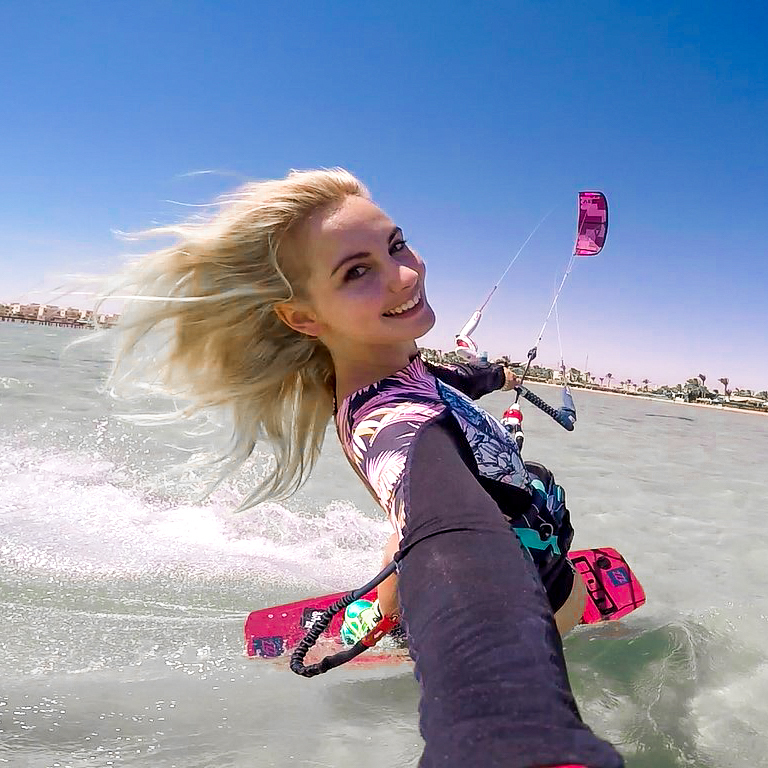 When it comes to kitesurfing, a lot of riders want to feel as free as possible. It’s the reason a lot of us don’t wear watches, sunglasses or impact vests during our session. These are all things that would be helpful during our session, but they would also restrict our movement and that feeling of being truly care free. So naturally I was a bit hesitant to try the wetsleeve on the water. But after a few minutes on the water I hardly noticed it was on my arm, even with a full 350ml of water in it! It is so important to stay hydrated – not only in your daily life, but also when you exercise! Dehydration can negatively affect your athletic abilities. Being able to sip on some water during my kitesurfing session was truly phenomenal and so easy with the wetsleeve. I could stay out on the water much longer and definitely noticed an increase in my usual energy levels. In the back of my mind, I also felt assured that if I were to crash and spend a lot of time swimming, I would not get dehydrated. I’ve noticed that a lot of people can spend hours doing water sports and feel completely fine without drinking any water during this time. But I’ve always drank a lot of water, especially when doing any kind of exercise, so the wetsleeve definitely works for me! I am genuinely passionate about conserving the ocean. Of all the trash that is floating on the ocean’s surface, plastic takes up approximately 90 percent of this! 50 percent of the plastic we use, gets used once and is then thrown away. It goes without saying that getting rid of plastic would be a great step in conserving our planet. One major problem contributing to the ocean’s pollution is plastic water bottles and straws. I love that the wetsleeve is basically a wearable, reusable water bottle. It is difficult to start giving up plastic and find alternative options, but it is important to start somewhere! Thank you!! Yes it’s still exercise and you still sweat and become dehydrated. Happy surfing!